The Affcoins Affiliate Program has closed down. All of the brands they promote are now under “Bestpay Partners” like Rockbet, Vegas Days etc. I received zero notification of this change, which took place in May 2014. My login for Affcoins doesn’t work for Bestpay Partners. So at this time I’d be hesitant in promoting them. I’ll try and get everything sorted with them and if so you’ll see a review of BestPay in the future – either positive or negative. I’ll update this review with a BestPay Partners review link when that’s all figured out. If you’re seeing this message – that means it still isn’t figured out and you should proceed with caution with BestPay Partners. The Affcoins review will remain online below for historical purposes. Affcoins Affiliate Program is the new affiliate program that houses Rockbet Casino. 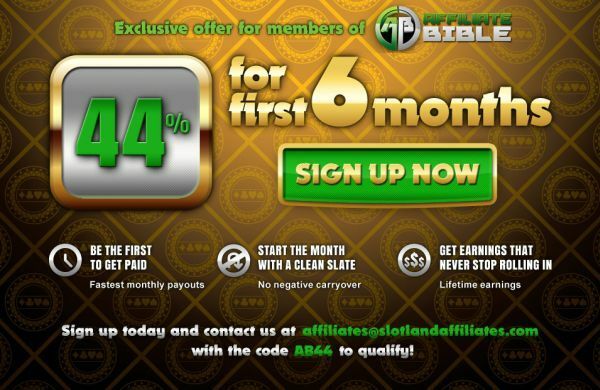 Previously, the Affcoins brand was known as “Rockbet Affiliates” but they have now revamped their whole affiliate program and are known as Affcoins. Affcoins Affiliate Program are the Affiliate Program for Vegas Days, Tradition Casino, Rockbet Casino and Casino Fiz. For the past few years, Rockbet Affiliates were one of my favourite groups to promote. Rockbet affiliates feature three brands which use Rival Gaming Software, which is Rockbet Casino, Vegas Days Casino and Slots Jackpot Casino. Unfortunately at this point in time, I cannot recommend the Rockbet group. The Rockbet group have had a change in ownership, and I find that the retention there is pretty much non-existent. I’ve sent hundreds of players there over the last few years, and I haven’t seen anyone play in awhile. They rarely send out mailers and when they do it’s very simple, basic reload bonuses. Even worse, is the Rockbet brands use Rival Gaming. Rival for all of 2010 and 2011 have struggled to do anything with payment processors. I’ve even sent them a few leads to no avail; it’s almost like they don’t want players to deposit. Thankfully, after a year of studying Affcoins, I am ready to both promote and endorse them again, as well as their brands. Affcoins have had ANOTHER change of ownership, and things are doing better at Affcoins. While I wouldn’t make them my #1 pushed program or anything – I WOULD recommend giving them a try again, and I will also be doing just that. Everything about the Affcoins affiliate program is a lot better, which is why I am prepared to give a much more positive Affcoins review. I’ve been trying them in a few spots with different traffic over the past few months, and have seen both conversion and retention go up. While nothing to write home about, it’s still a lot better than what it was. They’ve also did a great job at offering unique casino brands, all translated into different languages. Overall, Affcoins have impressed me lately, and I’m comfortable giving a positive Affcoins Affiliate Program Review, and would recommend you try them out for yourself. Rockbet Affiliates currently have 3 brands to promote. All 3 brands use the Rival Gaming software. The brands are Vegas Days Casino, Rockbet Casino and Slots Jackpot Casino. Rockbet Casino offers a 100% to $750 bonus to all players. They also offer special bonuses for each game, for example a 100% Blackjack and Video Poker bonus, or a 400% Keno and Scratch Card bonus. Vegas Days Casino offers a 100% to $500 welcome bonus. Vegas Days also for retention purposes, offer 5 separate deposit bonuses which the user must take advantage of to get in the Vegas Days VIP Program. Slots Jackpot Casino offers a 100% to $500 deposit bonus. Slots Jackpot casino also offer a 25% all game bonus, happy birthday bonuses, and the standard comp program. Rockbet Affiliates offer the standard tiered commission structure for all their casinos. Rockbet Affiliates do not offer any CPA or Hybrid deals at this time. You should however, be able to get a no deposit bonus to offer upon request. With Rockbet Casino, you should be able to get a no deposit bonus from them. That’s great to market for obvious reasons. Their homepage is also a refreshing change from the usual casino homepage, and I’ve found it’s more likely to get signups due to that homepage. Just contact the Rockbet affiliate department – as long as you use my sub-affiliate link you should be able to get a no deposit bonus for your players. Vegas Days is a casino that has the “Vegas feel” to it – at least on the homepage. Based on that, it’s a casino you can advertise to anyone, and I push it with the marketing vibe “Like Vegas in your living room”. That kind of marketing usually gets the players to click-thru. Slots Jackpot is an obvious one; promote it to Slots players, and Progressive Jackpot players. Unfortunately I find their conversions are minimal due to their poor homepage. They aren’t taking advantage of their brand name in any way, and I wouldn’t recommend promoting Slots Jackpot. All 3 Rockbet Affiliates casinos use Vegas Technology Software. None of the casinos accept players from North America(Canada & USA) at this point in time. The Vegas Days and Rockbet homepages are in English and French. Slots Jackpot homepage is English only. All 3 casinos offer a downloadable client for Windows, and a separate browser-based casino which Mac players can use. Q: When did Rockbet Affiliates join your “Not Recommended” List? Early 2011, which was probably a few months too late. The decision is not based purely on the Rockbet group as I love the guys there; but more on the problems Rival seem to have with payment processors, and the lack of conversions due to this for RMPs.